The Korean Fan Dance is one of the most popular and well-known movement pieces from Asia. The bright pink fans and dresses combined with graceful movement have thrilled audiences all over the world. The origins of Korean fan dancing are a combination of politics and religion. The court of the Cho-Sen dynasty was the basis for the intricate costuming and very precise movements. However, the movements themselves evoke natural phenomena, from the color and fringes of the peony-colored fans, to the many formations that recall blooming trees, flowers, and natural waves. 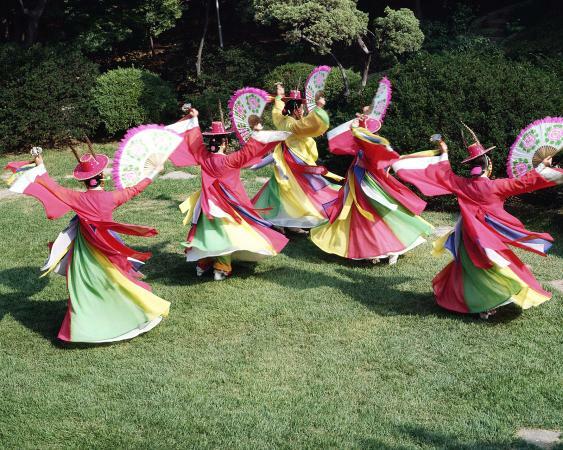 This choreography and costuming are closely related to the shamanic religious tradition of the Korean spiritual beliefs. The two have combined to create Buchaechum, which is the correct name for the dance. Originating on the peninsula, it has become one of the great ambassadorial art forms for Koreans around the world because the movement and color are stunning and captivating no matter what culture you are from. Buchaechum dancers all wear identical costumes. The main costume is the dangui, a coat and skirt with long, flowing sleeves and a phoenix embroidered on the front and back. Dancers all hold large fans that are painted with bright images of flower blossoms which help with some of the movements. Topping it off is a headdress that resembles a golden tiara, called the jokduri, which is the traditional marriage head piece. The dancers perform on a bare stage usually, brightly lit so that their choreography can stand on its own with nothing to distract from it. The beginning of the dance shows the dancers all posed in stillness, their fans held up in front of their faces. One solitary dancer reveals her face, and rises, moving the fans gracefully around her face and body. Gradually, the dancers around her begin to move their fans as well, as if waking up from sleep. Eventually, all twenty or so dancers are up, moving around the stage, and the original soloist tends to get lost as all of the identically-costumed performers go through the steps. Like the Rockettes from a much later culture, the Korean Fan Dance is all about precise movements by many dancers at once, who combine to seem like one big connected flow of movement. There are many videos on sites such as World Network that show the amazing transitions and stagecraft that bring the dancers together and apart in stunning combinations. In one section, there are three groups of dancers in what look like huddles, which suddenly open up like sea anemones or stop-motion blossoms, rotating as if blowing in the wind. A moment later, all the dancers are in a line downstage near the proscenium line, doing a "wave" that reflects the tide of the ocean with a liquid grace as the fans raise and lower in perfect synchronization. There are many more movement combinations, sometimes filling the stage with color and motion and sometimes contracting into tight balls of stillness, buzzing with potential energy. These are only some of the moves in Korean fan dance. The performance can be modified for various numbers of dancers, even a solo form as performed by the Jin Yurim Dance group. However, while the virtuoso performances can be beautiful, the full effect of the group choreography is what the Buchaechum is best known for. While native to Korea and performed by professionals touring the world, the fans and moves of the Buchaechum are also taught by community groups all over the world. Whether learning the dance or just watching the amazing performers, Korean fan dancing continues to delight dancers and audiences of all ages wherever it is performed.